While I do enjoy drawing with charcoal I kind of miss color while doing so. If you look at my paintings you'll notice I tend to get pretty colorful with them much of the time. I've added color to charcoal paintings in the last by first applying a watercolor wash and adding a few pastel pencil marks at the end. I decided to try something a little different this time. I did start out intending to do just a straight up charcoal drawing but as I went along I couldn't help imagine it with some color. First I just applied some ochre tinted charcoal to the foreground but that wasn't enough. So I got out my pastel painting travel box and picked out a few pastels with grayish tones that fit the theme of the drawing. I was concerned that the Arches hot pressed watercolor paper I was using wouldn't have enough tooth to hold the pastel so I made sure to keep a light touch. 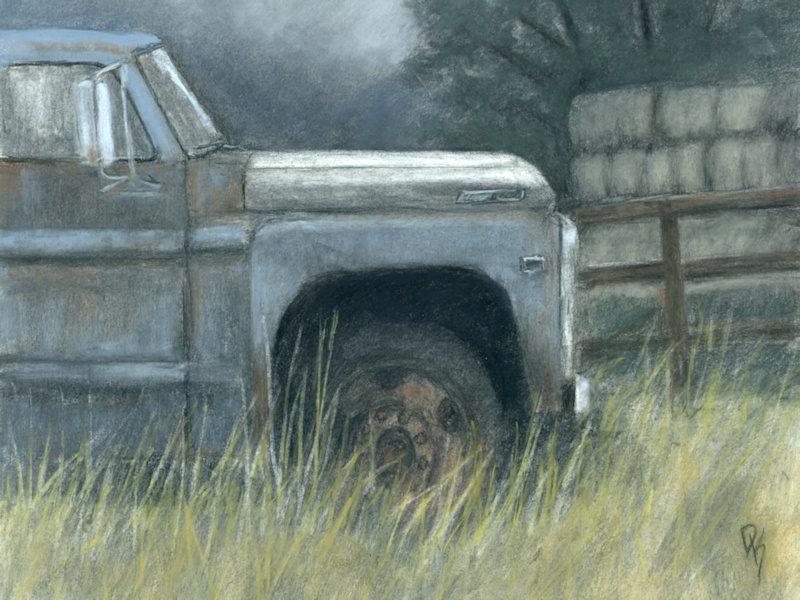 I was pleasantly surprised to see the paper take the pastel quite well, though only light layering is possible. Just the fact that the pastel was being mixed with charcoal kept the colors on the gray side but I made sure to use colors that would not overpower the drawing. Bright, saturated colors alongside charcoal just wouldn't look right, at least not with this subject. I'm pretty happy with how this worked out, I'm sure I'll mix pastel and charcoal more often in the future. As for the subject, it's an early 1970's Ford heavy truck. I'm not sure exactly which year or model but it had a gross weight rating sticker on it for 21,000 lbs. so it was pretty heavy duty. I found it sitting in a field on a ranch or farm in Leamington, Utah. Leamington is a very small town in west central Utah yet I enjoyed exploring it very much, it had a few abandoned tractors, trucks and cars as well as just having the general appeal of a rural town out in the middle of nowhere surrounded by open space. I saw very little movement while I was out there and heard even less, the kind of place I think I'd like to retire to. As for the title, "Bygones" I'm honestly not sure where it came from or how it applies to this drawing. Sometimes the title for a piece comes to me before I even start working on it, however more often than not I don't come up with a title until I'm finished and need to post it online, that's what happened to me with this one. While I was uploading the file the title just kind of popped into my head, I'm not sure what it means but for some reason it seems perfect.